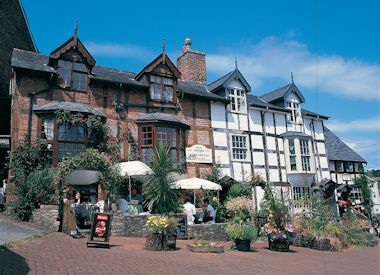 The town of Newtown in mid Wales is situated on the banks of the River Severn and dates from the 13th century - in 1279, King Edward I issued a charter allowing Newtown to hold a market on Tuesdays, a tradition that still continues. The booming textile industry in later centuries led to a period of industrial and population growth but it subsequently declined. Newtown can claim to be the home of the world’s first mail order company – The Royal Welsh Warehouse, established by Pryce Jones in the 1850s. He could boast Florence Nightingale, Queen Victoria, the Princess of Wales and royal households across Europe among his numerous customers. He sold Welsh flannel to America and Australia and one of his products included an all-in-one rug, shawl, blanket and pillow which was used extensively by German troops during the Franco-Prussian War of 1870-1 and which later became known as a sleeping bag. Newtown’s most famous son is social reformer Robert Owen and a statue in his memory is located in the Robert Owen Gardens. Robert Owen was the founder of the Co-operative movement. He established new standards for providing workers with better living and working conditions and later established model communities in Scotland and America. Today, Newtown has a ‘small town’ appeal and charm. It attracts shoppers, theatre goers (Theatr Hafren) and provides visitor attractions such as the Robert Owen Museum and the Textile Museum and a major art gallery - Oriel Davies Gallery. It also hosts the original and world record breaking Santa Run in December! Set in the heart of Powys, Newtown offers a good range of highly-rated accommodation and is an ideal centre for exploring mid-Wales.